Cobras are snakes that are characterized by a hood at their neck that spreads out when they're threatened or angry. They can raise their heads high above the ground and are favored by snake charmers. Cobras are among the most venomous snakes in the world and are found in a variety of habitats from tropical rainforests to savannas and deserts in Africa, the Middle East, southern Asia and some islands of southeast Asia. Africa has several spitting cobras that aim venom at the eyes of an attacker. They are found in Angola, Benin, Botswana, Burkina Faso, Burundi, Cameroon, Central African Republic, Chad, the Democratic Republic of the Congo, Djibouti, Ethiopia, Gabon, Gambia, Ghana, Guinea Bissau, Guinea, Ivory Coast, Kenya, Liberia, Malawi, Mali, Mauritania, Mozambique, Namibia, Niger, Nigeria, Rwanda, Senegal, Sierra Leone, Somalia, South Africa, Sudan, Tanzania, Togo, Uganda, Zambia and Zimbabwe. Africa has a range of water cobras, snouted cobras and forest cobras live throughout Africa. Water cobras are found in central Africa and grow to two meters. Forest, or tree, cobras are found in tropical forests in central and west Africa and are even longer. The Egyptian cobra is found in the Arabian peninsula as well as the deserts of North Africa, and is fairly common. The venom is highly toxic and is responsible for several deaths each year. There are several spitting cobras in Asia. The Philippine cobra is found in the northern regions of the Philippines, while the Samar cobra is found in the southern Philippines. The Indochinese spitting cobra is found in Southeast Asia, including Thailand, Laos, Vietnam, Cambodia and Burma. The Javan spitting cobra is found on the Indonesian islands of Java and other islands in the group, including Bali. The equatorial spitting cobra is found in Indonesia, the Philippines, Thailand, Singapore, Malaysia and Brunei. 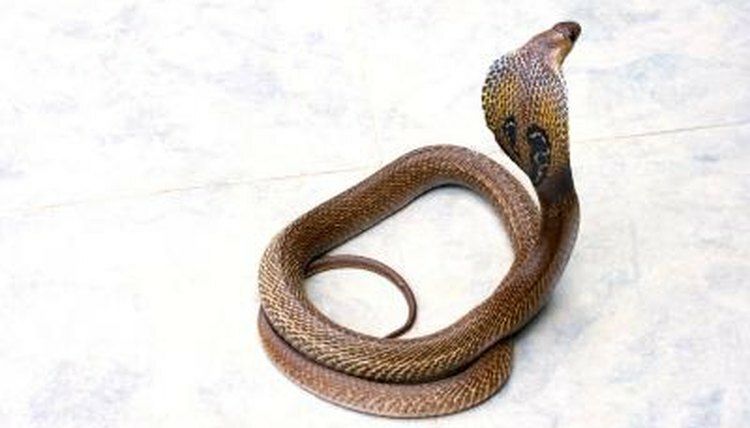 The king cobra is the longest venomous snake in the world and is unique because it builds a nest and guards its eggs until they hatch. It also eats other snakes and is found in India, southern China, Burma, Malaysia and the Philippines. Another species is known as the Asian, spectacled or Indian cobra and is found on the Indian subcontinent. It has a very large hood with a spectacle pattern on it and is often used by snake charmers. It's responsible for many deaths each year.